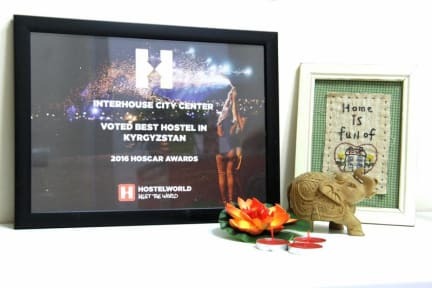 Interhouse City Center wants to make your stay as much comfort, fun and cozy as possible. 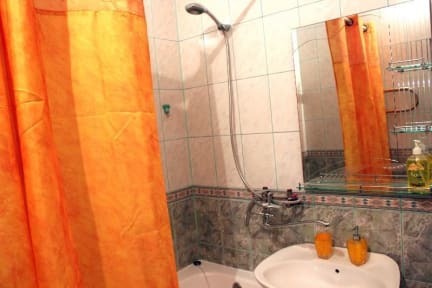 Home-like atmosphere, hot showers, attentive and friendly stuff is what every guest finds at Interhouse CityCenter. We care about the quality hospitality and accommodate guests with FREE hot breakfast, comfortable beds with orthopedic mattresses, drinking water, refrigerator, lockers, linens, hairdryer, ironing, free WI-FI, Notebooks, and many other complementary services and items. Ostello carino, semplice ma con tutto il necessario per un soggiorno a Bishkek. Personale gentile e disponibile, colazione compresa cucinata al momento (ottimi i pancakes alla banana!) e posizione abbastanza centrale. Ma la cosa più bella è l'atmosfera: l'ostello è piccolino e famigliare e rende molto facile conoscere altri viaggiatori e stringere amicizia!